Wauseon Tree Commission members, from left, Larry Frey, Tom Collins, and Rick Frey planted Ohio Buckeyes in the Indian Hill Trail adjacent to Homecoming Park. Planting the Buckeyes is part of an enhancing project to plant trees of various species in place of dead ash trees that were removed last year. There are tree identification plaques throughout the walking trails. 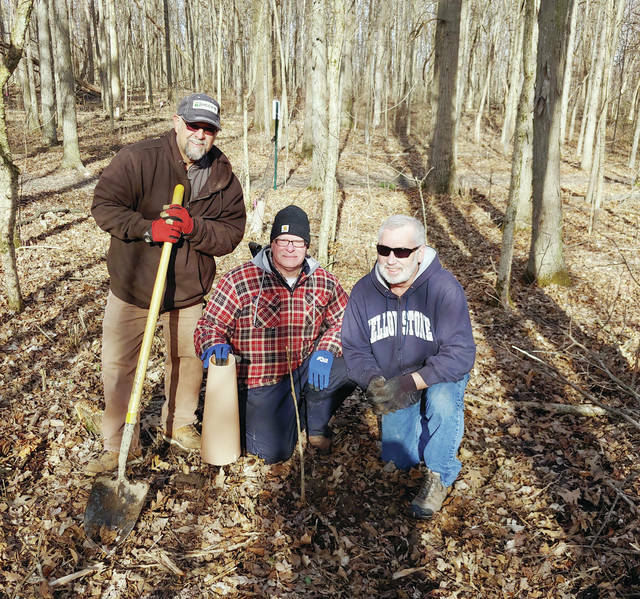 https://www.fcnews.org/wp-content/uploads/sites/45/2019/04/web1_buckeyeplanting.jpgWauseon Tree Commission members, from left, Larry Frey, Tom Collins, and Rick Frey planted Ohio Buckeyes in the Indian Hill Trail adjacent to Homecoming Park. Planting the Buckeyes is part of an enhancing project to plant trees of various species in place of dead ash trees that were removed last year. There are tree identification plaques throughout the walking trails.